The Tampa Bay Lightning have signed free agent center Mike Angelidis to a one-year, two-way contract today, Vice President and General Manager Steve Yzerman announced. 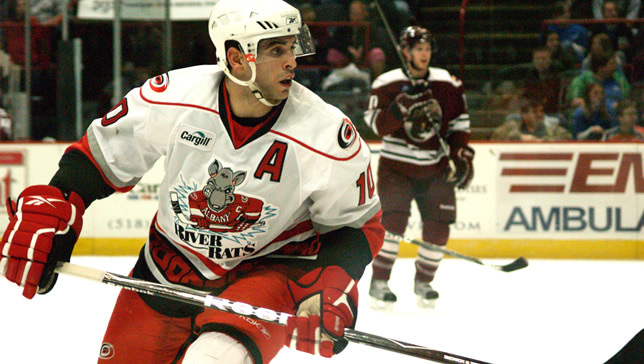 Angelidis, 6-foot-1, 200 pounds, has played in 235 career AHL games, all with the Albany River Rats in the Carolina Hurricanes organization. During that time he has amassed 42 goals and 85 points with 456 penalty minutes. In 2008-09 Angelidis led the River Rats in penalty minutes with 142 and was also tied for fifth in goals with 15. During the 2007-08 season he was second on the team in penalty minutes, tied for sixth in goals with 11 and sixth in points with 27. Angelidis also played in 24 games with the Florida Everblades during the 2006-07 season, recording 10 goals and 18 points. A native of Woodbridge, Ontario, Angelidis spent his junior career with the Owen Sound Attack of the Ontario Hockey League, where he amassed 78 goals and 132 points in 240 contests. He had his best junior season in 2005-06 when he ranked third in the OHL for goals with 53 while being named to the league’s First All-Star Team. Angelidis was also awarded the Dan Snyder Memorial Trophy as the 2005-06 OHL Humanitarian of the Year. That season he was also voted at the league’s Most Improved Player in the Western Conference Coaches Poll. Angelidis also finished second in the voting for Most Underrated Player and Most Dangerous in the Goal Area. Angelidis, now entering his fifth professional season, signed with Carolina as an undrafted free agent on July 21, 2006.